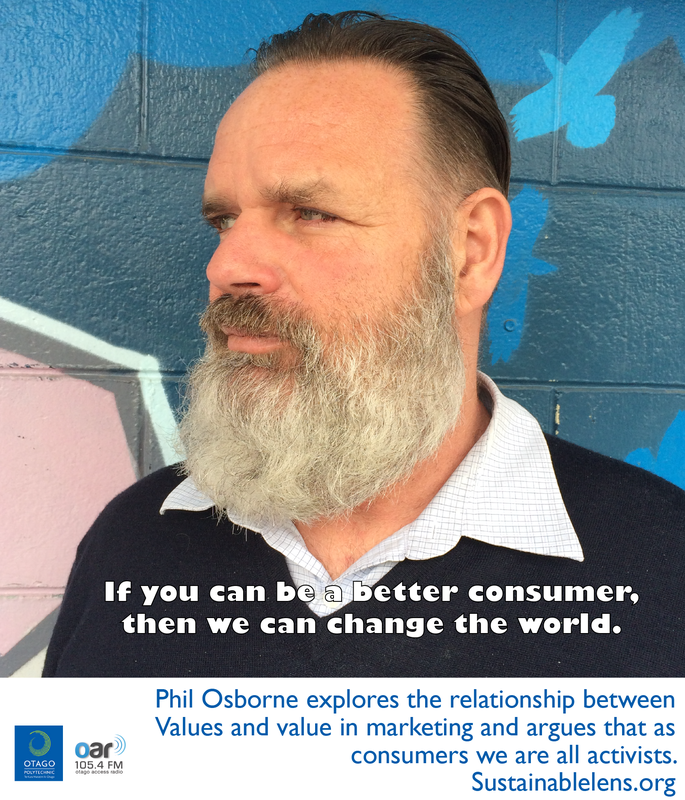 Phil Osborne teaches and researches marketing at Otago Polytechnic. We talk about the role of marketing and the relationship between values and value, before exploring what the sustainability agenda can learn from marketing. Things only become valuable when we use them. In the 60s-80s we had this surplus to get rid of, and we didn’t think about why customers wanted to buy these products. I see value as in economic value with a little v, and Values with a big V. Values is what society or individuals are starting to see as worthwhile. So, value in terms of a market exchange comes from the Values of society. Marketing is a child of the industrial revolution which privileged the view of the firm – they made massive gains in the factories and efficiencies. Look, society is must better off because we can produce these things. And because society was supposed to be better off, the production view was privileged. But now this has flipped, the service dominant logic asks “is it products we want, what do we do with those products?”. So service dominant logic is still about exchange, but exchange of service. Marketing had a lot of currently useful generalisations, and at present, a lot of those are no longer useful. At heart of marketing ethics is a satisfied customer. How do measure satisfaction, I think there’s an ethical way of doing that. If they are getting their product or service delivered in an unethical way, it’s likely to impact on their satisfaction. The ethics of marketing becomes very transparent. The snake-oil salesman is a generalisation for a reason – people don’t like that approach. Ethics in business school has become a much larger and more obvious subject to deal with since Enron example, and what happens when you let businesses run away with the efficiency model. In developing sustainable practitioners, that ethical transparency is gives to sustainability – ethics in the end is an individual choice, organisations don’t actually make decisions, individuals within the organisation make decisions. If you are in a organisation and you feel like they’re about to do something unethical, it’s only individuals who can make that change. Students find it hard to think about their great grandchildren, so my analogy allows them to plug into the understand of their grandmother – but this is really about getting them to think about the future. We’re on cusp of dawn of the end of dinosaurs of organisations. Questions being asked: How do we create organisations that allow employees behave ethically. How do we reward whistle blowing? This is a positive thing, an age of these questions being asked. And they’re not being asked around the water-cooler any more, well they are but water cooler is the internet and the boardroom. Marketing has always been about sustainable business, the heart of marketing is about relationships. And those relationships can only be sustained when we are doing things that we each like. Marketing can bring to the table the role of representing the customer at that table – the marketer is the customer’s voice in the organisation. The voice of sustainability among customers is becoming larger and larger – and the marketer is the one that is going to carry that voice into the organisation. So how to we value sustainability? It typifies the dominance of the paradigm that we want to value it somehow, to put a number on it. And we can put a number on it in that customers are starting to think about maybe I’m not going to buy that thing because it is cheap because I don’t know what their organisational practices are like. Brands indicate a level of trust. In the future I think we’ll see that the brands and trust value will enable us to understand the value that customers are putting on sustainable practice. (how do we wade through the marketing greenwash?) Greenwash was the marketing response when we still had that sales response – let’s trick our customers into thinking we’re green by putting dolphins on there. The can’t do that anymore. We might have gotten away with that in the 70s or even the 90s. Nowadays you put a dolphin on there and someone is going to go and track why that dolphin is on there. (Are you an activist?) Yes. I’ve had 7000-10,000 students over the years. If I’ve made even half of them consider their practices differently and decide not to stuff a leaflet in your letterbox without any understanding of what that is doing, then I’ve made a few changes. I think we’re all activists as consumers, we all have the chance to be activists. If all you take from understanding marketing is being a better consumer, then we can change the world. Marketing is no longer a simple relationship. Society’s conversation about sustainability is influencing consumers’ beliefs, which then has to influence the marketing conversation. It is not longer a delivery of products – a monolithic dyadic conversation dominated by the marketer to a dialogical, learning together, thinking about what is best for society. (Challenge) Changing the perception of marketing. (Advice) Become a more conscious customer, every time you spend money with an organisation you are voting for its continued existence. So think about whether you condone it.